Playing middle linebacker at the college level is brutal. John broke his neck playing football and spent two years recovering before he could pump iron again. I was a promising athlete growing up. After school, you could find me on the gridiron as a middle linebacker, the wrestling mat, or pumping iron to bring my athletic skills to the next level. After graduating high school, I received the 2005 Regional Defensive Player of the Year award as the area's top middle linebacker and a scholarship to play college football. During college football, I was involved in head-on collisions almost every play, which eventually caught up to me. I started feeling pain and it didn't stop at my neck. It traveled down my arms and hands due to the pressure on my spinal cord. At times, the right side of my body was in a state in a paralysis. I consulted a surgeon who said one more hit could put me in a wheelchair due to a ruptured disk in my neck that fragmented into my spinal column. The diagnosis stripped my college football scholarship and changed my life forever. Football was taken from me before I was ready. After pondering for a few days, I realized it was a small speed bump. I was only 19 years old and my whole life was still ahead. However, the road was long and steep. My body began to atrophy, and I lost 30 pounds. 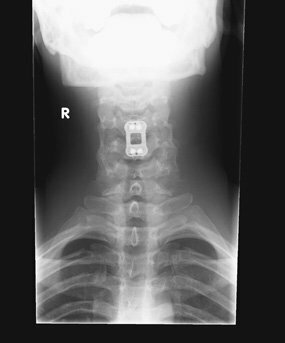 In May 2007, I underwent a three-hour neck fusion surgery that permanently placed four screws and a titanium plate in my vertebrae. My first thought going into surgery was, How fast can I be back and what sacrifices will I need to make? For the next 19 months, I rehabbed my neck to regain motion and mobility. At the end rehab, I was down to 160 pounds and was embarrassed of my physique. I had two options: be upset or do what I could to get better. I went back to doing what I knew best. After I was cleared to train again, I decided to get my life back. I went back to the gym and trained intensely. I transformed my body and added 30 pounds of lean muscle in one year. My bodybuilding background fueled my ability to overcome this challenging obstacle. Being a competitive athlete before helped me strive in a new sport. I have dreams and aspirations and I don't intend to fall short or be afraid to go after them. Since I've been healthy, I've fulfilled many long-term goals—competing in a natural bodybuilding show, attaining my personal training certificates, and winning a body transformation contest. In 2010, I got down to 180 pounds with 5 percent body fat for my first bodybuilding show. I dedicated myself by dieting rigorously and training twice per day for six months. I placed second, which was a great accomplishment. In 2011, I decided to pursue personal training so I could bring people into my world. In 2012, I entered Labrada Nutrition's Lean Body Challenge and took first place in my division. I can confidently say that I'm happier, healthier, and mentally stronger than ever with no signs of slowing down. I knew accomplishing my goals would take lots of planning, exercise, and dieting. While recovering from my neck injury, I read fitness books and magazines, which helped culminate my knowledge for my comeback. I created a scrapbook to leverage tips and ideas and watched inspirational videos: Pumping Iron, Bill Phillips' Body of Work, John Cena's workouts, and YouTube clips of my favorite bodybuilders and athletes. I'd be lying if I said my journey was all smooth sailing. There were days that I was tired and exhausted, but those were the days I pushed harder and visualized the peak of the mountain. Giving up never crossed my mind. I knew I was going to make it. I looked back at my before pictures and told myself I wasn't going back. Bodybuilding is something ordinary people do to become extraordinary. When it was gym time, I was always there. When I walked through the doors, it was 100 percent pure adrenaline. I envisioned that every workout, meal, set, and rep would bring me closer to my goals. I take supplements and vitamins to make sure my body gets everything it can't from my diet and to provide high energy levels. I eat every three hours to keep my metabolism revving. This keeps my body in fat-burning mode instead of survival mode. I'm never full or bloated, but never hungry. I drink two gallons of water per day and adjust my diet to energy expenditures for the day. I always do fasted cardio in the morning when glycogen stores are depleted. My body is more apt to burn fat at that time. I keep my workouts short and intense (60-75 minutes). I always change my routine to stay fresh and avoid plateaus. I warm up in a sauna or bike for 10 minutes and stretch after. I maintain great form and lift as heavy as possible for as many reps as possible. I'm very basic. I don't listen to an iPod. I don't get caught up with bands, balls, knee wraps, bench shirts, chalk, elbow pads, and other apparatuses. I show up to work. I do 20 minutes of morning cardio on an empty stomach Monday-Saturday consisting of hill sprint intervals or HIIT on a treadmill. The aspect that challenged me the most was learning to listen to my body. Suffering an injury of the magnitude that I did made me watch for signs of soreness and discomfort. Prior to my injury, I exhausted myself beyond reasonable boundaries—those days needed to end. I always was a bit overzealous. Now I train smarter. I'm in this for longevity and health. I stayed positive, kept an open mind, and thought my comeback was destined. I adopted a never-say-quit attitude and persevered through any hurdle thrown at me. I have a broad set of future fitness plans. I want to make a positive impact on people by helping them build a better body and mind. I'd like to get involved in fitness modeling opportunities. In addition, I'd also like to pursue a career in personal training and serve as a mentor for anyone looking to get into health and fitness. The time to start exercising is now. Don't wait for things to be perfect; life will never be perfect. You will be waiting forever. Create long- and short-term goals. Monitor your progress with a workout and nutrition journal and take progress photos. Never quit. Keep your mind open and stay positive. Just keep going. Don't be in this for a quick fix; make it a lifestyle. Bodybuilding.com helped me reach my goals. The broad range of topics that Bodybuilding.com covers inspire me to check out the site frequently. I enjoy the transformation stories. They help me stay motivated and provide advice. I also like the updated Facebook page, which helps me stay up to date on the latest articles. BodySpace is another great tool, which allows me to keep training logs, workout stats, and a photo gallery. It allows me to interact with friends and other fitness athletes. I compiled this professional video that chronicles my life and my journey to come back from injury. Feel free to check it out and let me know what you think.